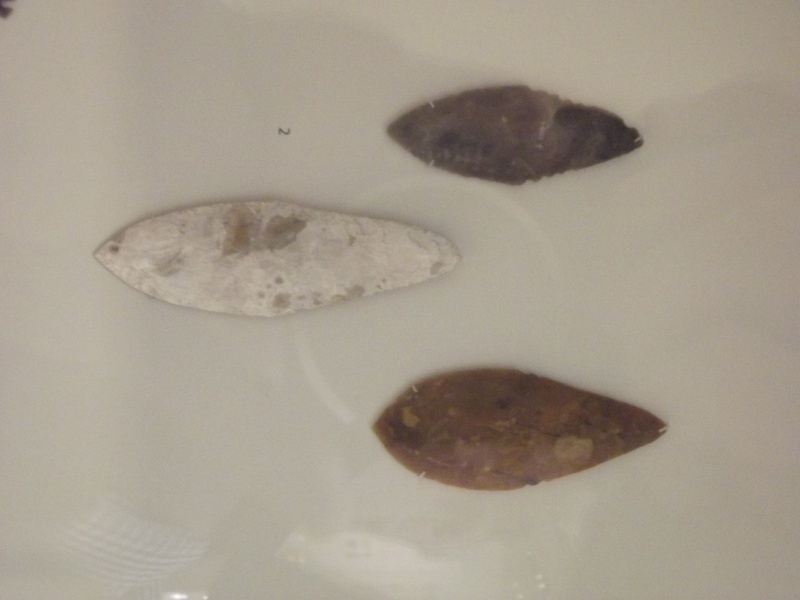 A nice PDF someone put together of Beaker Dagger handles found in Denmark. They all seem to be made of wood wrapped with some kind of cord. Cool, I have seen the picture before, but not the Illustrations, pity the scale is not too clear. Is there any reason to think they hafted them differently over here? The Amesbury Archer's dagger seem's to have been hafted this way. British Museum haft their's pretty similarly. Also while on the subject I've been meaning for a while to replicate this rather unusual design. It's in John Evans, supposed to be in the British Museum (at least in 1872) and is regarded a Beaker Dagger by Evans. Of course it was pulled out the Thames so could easily be something else. Anyway it's 7" long (I've created it 1:1 scale in Photoshop, just for you [which this damn website is not correctly reproducing:( ]), now Evans as an interesting interpretation suggesting the form of the point appears to be cut down and it may originally have been longer, which would explain the unusual design, however looking at the profile illustration the way the convexity tapers out perfectly evenly to the tip, it looks to me as if this is how it was made and was not cut down. So what do you think? Great capture of all those illuistrations and a fascinating subject. 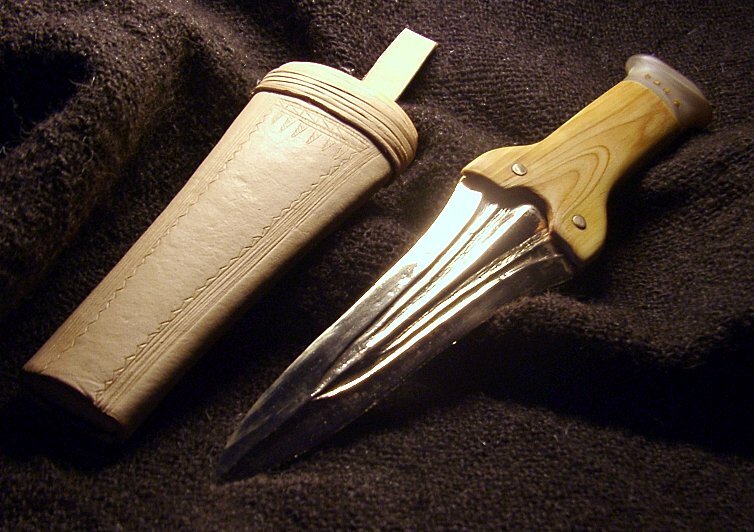 One of the things i love in ancient blade design is that it is not so dogmatic as today, and is unconstrained by expectation in comparison to todays commonly used (and often homogenous) steel knives. The one above is a great example - plenty of cutting edge, but enough in the way of different cutting profiles to be multifunctional. But thats what you get when you're living a practical lifestyle and have to make (or trade) what you need. Totally looks an intentional design too, and a good one. I have not seen any over here with a preserved handle, only time will tell. I have long thought that they would closely resemble the handles on the early copper daggers. The pdf shows this is true of the danish examples, the British early Bronze age copper ones also usually have a pommel made from bone, some from amber. 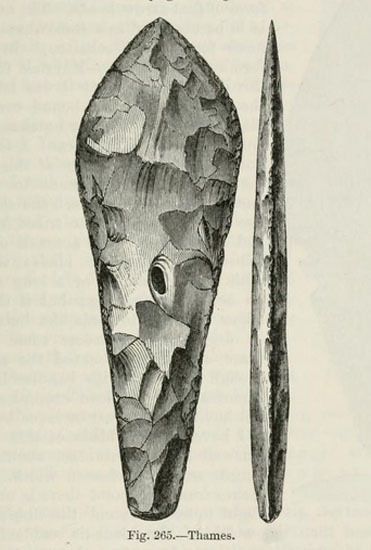 The Beaker dagger from the Thames has slightly unusual proportoins, but within the relms of regional variation. I have a photo of it somewhere, I'll dig it out, it looks complete to me. Here's a prototype handle I did yesterday. ETA: those flints are gorgeous too.. i'm off to Northampton at the weekend (and lincs in a couple of weeks) and may well hop on to Quarryland from there and fill my GF's car with chalk dust, god bless her. No it isn't split, I dug out the handle about 2 inches deep for the tang. 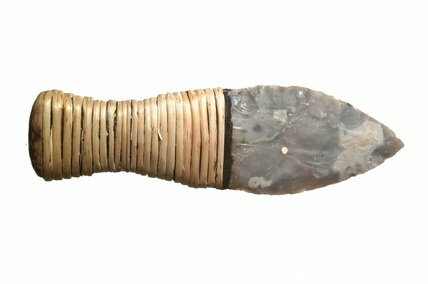 As to whether Beaker dagger handles were split, this is a mute point as Otzi knives were, the next one I make will be split for comparison. I'm pretty sure chalk dust has mystical qualities, nomatter how many layers of air tight plastic you line the boot with it always finds a way through, and then spreads to the rest of the car. Good work, especially with the Lego! Nice find, looks like you have a middle Bronze age Rapier there, they where really long so there is probably more of it to find! Awesome find, definately looks like a rapier! So now you have to go back to where you found it and hunt down the other 90%. I gave the area a good going over but will return when the crop is off, problem is the farmer has spread the dreaded green waste on the field so its now covered in aluminium and industrial waste. Ah recycling! Don't you just love it! I hate digging aluminium, it sounds too good! In short, you could use a chain of a few vertebrae..
or there are the so called "cholla" handles from some american cacti - dunno if only a specific variety would work and i've not looked into it. I have some fairly large cacti though, and imagine that due to them shrinking to next to nowt when they dry that a pretty huge one would be needed. Wow. That's a website you don't see everyday.. Here's one I was thinking for handles. there are a few on ebay but overly carved and expensive, wish I could find a cheap source of basic ones like this. 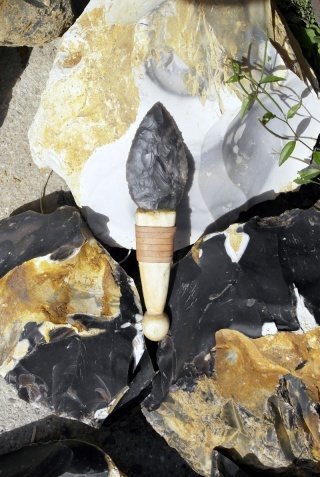 you could do a deal with a maker in exchange for some knife blades or a nice axe, adze etc... just dangle the correct stone age lovelies and bob's yer uncle - many folk can carve wood but there aint many skilled knappers here in the uk remember, and heaps of folks make wood spirits. I've seen some lovely carved antler too, all just done via dremel as well. as you say a web site you don't see every day - I wonder if there are any restrictions with exporting some of the items for sale or would customs pull them to search. I would imagine that the vast majority would be fine, and i guess Customs and Excise have a web page somewhere with listed restrictions etc. You may still find it's been opened though and comes with an explanatory letter when it arrives.
" /> Three more from the British museum. The little black one is multi notched.